Whether you have been living in the same home for 20 years or you are just preparing to move into your fixer-upper, transforming your deck into a screened-in porch can be a fantastic decision. Whether you have been living in the same home for 20 years and are looking for ways to change up your space or you are just preparing to move into your fixer-upper, transforming your deck into a screened-in porch can be a fantastic decision. Here are some of the biggest benefits that come along with a new screened-in porch. Screened-in porches are an amazing compromise between the great outdoors and the inside of your home. If you love sitting outside with a good book and a glass of iced tea in the summer, an addition or sunroom might lack the breezy and fresh feel of sitting on the porch. However, a screened-in porch can provide you with the breeze you long to feel and the lack of bugs swarming around your sweet tea you need. Screened in porches can allow you to use things you wouldn’t typically use on an exposed porch outdoors and feel safer about doing so. You might not leave outdoor speakers or ceiling fans near your typical porch, as that’s just asking for a rainstorm overhead. However, with a screened-in porch you can safely leave and enjoy electronics outdoors during all but the most severe rainstorms. Make sure to still use outdoor-rated products for your ceiling fans, lights, and furniture, as the humidity and heat they face during Maryland summers will cause them to droop and get damaged over time. 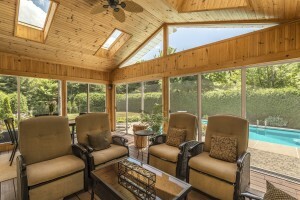 Screened-in porches offer an awesome return on investment if you are planning on selling your home in the future. They increase the resale value of your home and add a major boost to the curb appeal, as a picnic outdoors with no mosquitos is almost every homeowner’s dream. Ready for the Screened-In Porch of Your Dreams? Mid-Atlantic Deck & Fence has almost 30 years of experience in building beautiful custom fences, gazebos, screened-in porches, and decks throughout the state of Maryland. We have the expertise to design your dream fence or custom deck and have it installed in a headache-free process. Give us a call at 1-800-833-9310 or visit us online for a quote today! We offer many different styles of fencing and decking in addition to custom options designed specifically to suit your preferences and tastes. To see examples of our work and get more tips on how to choose the right screen-in porch for your family, follow us on Facebook, Twitter, Houzz, Pinterest, Google+, YouTube, and LinkedIn.